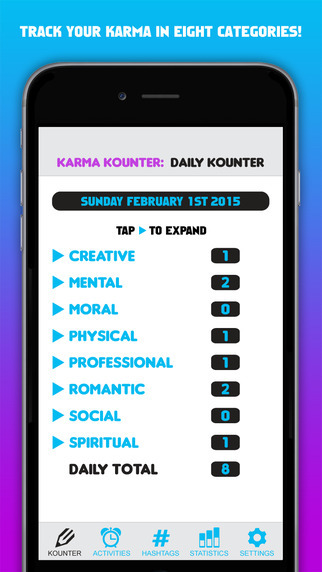 Karma Kounter is an iPhone app from developer Skipnosis Studios that aims to help us all live more meaningful and fulfilling daily lives. 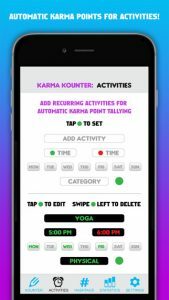 With the ability to accumulate and ‘earn’ Karma points for completing tasks or working on projects, you can keep track of how good your Karma is with this iOS app. There are eight categories – Creative, Mental, Moral, Physical, Professional, Romantic, Social and Spiritual – each with a bunch of sub-group options to choose from. Some, like Authoring, Composing and Performing are objective ‘doing’ descriptors whilst others like Fairness, Forgiveness and Generosity are more esoteric and require you to dig a little deeper into the meaning behind your own actions. Besides the pre-loaded virtues, you can also add in your own within the app. Each day you’re encouraged to ‘Kount’ your Karma by adding or subtracting points to these virtues based on what you’ve done (or not done) that day. 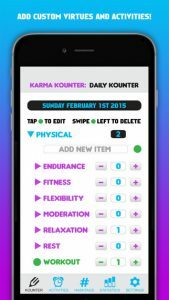 Karma Kounter allows you to schedule Activities that you do or perform on a weekly basis, automatically tallying Karma points. The app also comes pre-loaded with a number of Karma hashtags which you can use to earn double points. The UI is clean and easy to navigate with a simple menu along the bottom of the screen and a series of drop-down menus detailing the various ‘virtues’ described above. The app can be sync’d with iCloud and Karma points can be shared via the standard social networks, as well as connect with the popular wearable fitbit. Karma Kounter is free to download – check it out today. 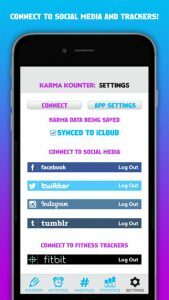 Karma Kounter requires iOS 7.1 or later. Compatible with iPhone, iPad, and iPod touch. This app is optimized for iPhone 5, iPhone 6, and iPhone 6 Plus.